Members enjoy a quarterly newsletter, regional “Meet-Ups” and workshops, the EEASC Listserv, an annual conference, engaging learning experiences, and opportunities to make new friendships and enjoy experiences with people who share similar goals and concerns. EEASC has hosted an annual conference for many years at different locations around the state. The conferences provide opportunities to engage with people and organizations that promote environmental education. Conferences have concurrent and plenary sessions, hands-on workshops and activities, field trips, exhibitors, and opportunities for networking. 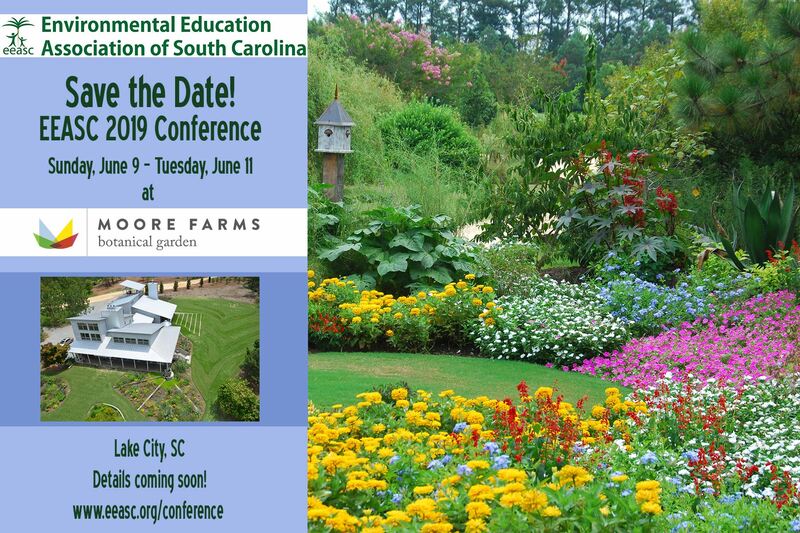 Each annual conference is a unique event and we are excited by the opportunity to have this year’s conference at Moore Farms Botanical Garden in Lake City, SC. EEASC Board members work hard to keep the conference registration fee as low as possible while offering quality environmental education experiences through lectures, field experiences, hands-on workshops and other events. By supporting the 2019 EEASC Conference you will enable educators in your area to attend a quality event that fosters their continued learning about our natural environment. No matter which level of giving you choose, your organization will be promoted in the following ways: signage, printed and electronic conference materials, EEASC websites, social media, and more. Sponsors may designate which event they wish to sponsor, or they may elect for their sponsorship to go toward general conference needs. There may be multiple sponsors at each sponsorship level. • Donation at this level can be used towards general conference needs. Palmetto donors will be given promotional signage throughout the conference and have the option to present the guest keynote speaker. Donors at this level will also be announced during the Monday evening dinner, listed in the Monday evening awards presentation, listed as a major conference sponsor on EEASC’s website, and listed in conference materials. Spotted Salamander donors will be given promotional signage during the sponsored meal and during the presentation of the guest keynote. Donors at this level will also be announced during the Monday evening dinner, listed in the Monday evening awards presentation, listed as a major conference sponsor on EEASC’s website, and listed in conference materials. Wood Duck donors will be given promotional signage during the sponsored meal. Donors at this level will also be announced during the Monday lunch and will be listed in conference materials. White-Tailed Deer donors will be given promotional signage during snack breaks and breakfast and will be listed in conference materials.